Phone bank volunteers this weekend urged those who haven't voted to turn out Tuesday. At this phone bank Democrats called on behalf of Hillary Clinton and Pete Gallego. This year Hispanics made up a larger percentage of early voters in Bexar County – and the state- than they did four years ago. Democrats believe that will help their candidates. Republicans aren’t so sure. Both parties were analyzing the impact of the Latino surge as they made a last push for turnout this weekend. 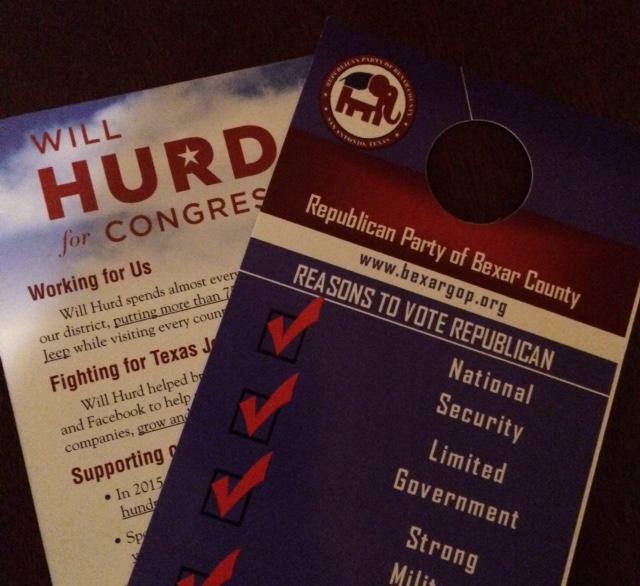 In the Northwest corner of Bexar County, Republican volunteers Brook Meads and Hunter Arvin knocked on doors of likely GOP voters, urging them to cast ballots for Congressman Will Hurd who’s locked in a tight race for reelection. 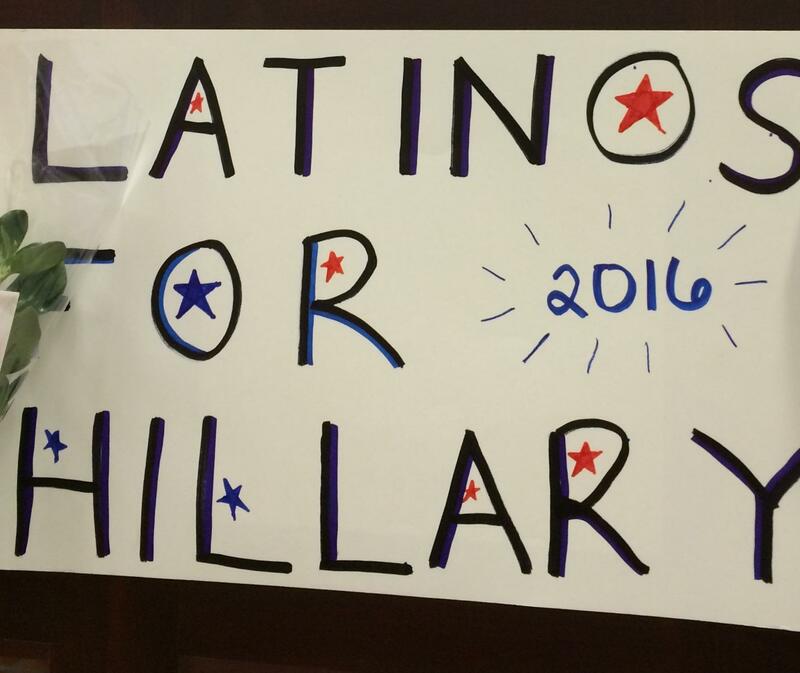 It’s no mistake that Democrats link Gallego and Clinton in their pitch to voters. It’s a reminder in this heavily Latino county and congressional district that both Democrats are running against a Republican whose anti-immigration rhetoric has seemingly galvanized Hispanic turnout. “Donald Trump has based his campaign on attacking Hispanics,” said Bexar County Democratic Chairman Manuel Medina, who calls Trump’s rhetoric a gift because he believes a wide majority of Hispanics in Texas will vote Democrat. “This election is not necessarily about what presidential elections traditionally are- Social Security, Medicare, minimum wage. It’s about respect. It’s about respect for the Hispanic community,” Medina added. Medina has been analyzing the record high number of early voters in Bexar County, and says the percentage with Hispanic surnames increased 15 percent over early voting four years ago. Statewide the estimated increase in the share of Hispanic-surname voters is around 20 percent. Bexar County Republican Chair Robert Stovall sees it differently. “We believe if Republicans come out in the southern part of Bexar County all of Bexar County we’ll win,” Stovall said as he finished up several hours of block-walking Saturday. Stovall says Republican State Representatives John Lujan and Rick Galindo are poised to keep their Texas House seats even though they’re running in the southern part of the county where Hispanics traditionally vote for Democrats. “These are very competitive districts now when before they weren’t. This is part of what we’ve been doing as the Republican Party, which is reaching out to these heavy Hispanic areas and putting good qualified Republican candidates and winning,” Stovall said. But as local Republicans have reached out, their Party’s presidential nominee has thundered about some Mexican immigrants being rapists and murders. Trump wants to build a border wall between the United States and Mexico. Bexar GOP Chair Robert Stovall and RNC Committeewoman Toni Anne Dashiell blockwalk for Republican candidates. 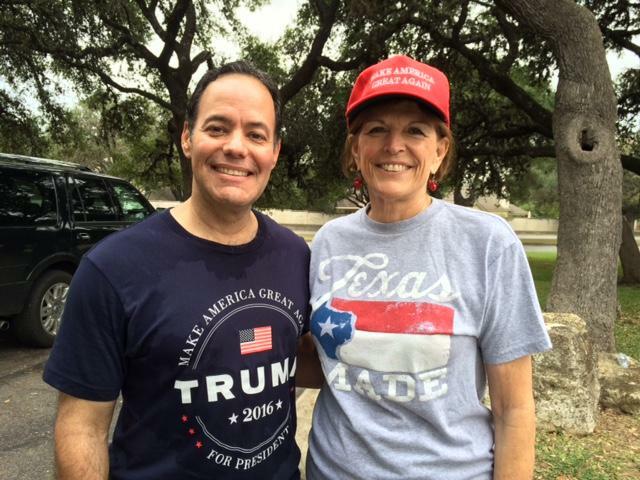 Republican National Committeewoman Toni Anne Dashiell of Boerne believes her Party’s voters – and conservative Hispanics- are overlooking Trump’s immigration rhetoric and the vulgar comments he made on a video about women. Dashiell is predicting a double-digit victory for Trump in this red state. Texas Democratic Party Chairman Gilberto Hinojosa is hoping Clinton will do what no Democratic presidential candidates has done in Texas for decades - come within single digits of her GOP opponent. “It will be a significant moving of the needle forward is the way I want to put it,” Hinojosa said during a stop in San Antonio, as he drove around the state on a last minute get-out-the-vote swing. Hinojosa says this election, and a continued increase of Latino voters, could create an environment for Democrats to win statewide in two to four years. County elections judges across Texas are scrambling. A historic number in the Lone Star State – 15 million -have registered to vote in Tuesday’s election. Early voting hit historic highs, so crowds are expected on Election Day. Texas has never seen an early voting surge like this before. Driven by the acrimonious contest between presidential candidates Democrat Hillary Clinton and Republican Donald Trump, voting lines have been long ever since early voting kicked off on October 24th. With 38 electoral votes, second only to California, keeping Texas a red state is critical to Republican plans of retaking the White House. This is true for this Tuesday and into the future. If the world could decide the next U.S. president, who would they pick? A German newspaper Die Zeit asked its readers that very question. Other foreign newspapers sent their correspondents to the States – to Texas, in particular – to cover the U.S. election. Johannes Kuhn, a reporter from the German newspaper Süddeutsche Zeitung, says he's been covering the election in and around the Lone Star state. He says the biggest surprise is the way it's been both "entertaining and very over-the-top."